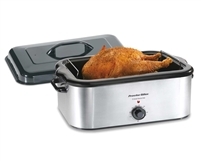 Proctor-Silex® Roaster Oven/Warmer, 18 quart capacity, cooks, warms, roasts & bakes, adjustable temperature controls, cool-touch handles, removable rack, double coated removable pan, 120v/60/1-ph, 1000 watts, ETL, 1 year warranty. 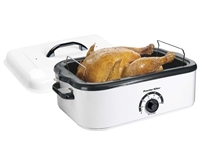 Proctor-Silex® Roaster Oven/Warmer, 18 quart capacity, commercial duty, cooks, warms, roasts & bakes, adjustable temperature controls, cool-touch handles, removable rack, double coated removable pan, stainless steel construction, 120v/60/1-ph, 1440 watts, ETL, 1 year warranty. Copyright © Session Fixture Co.. All Rights Reserved.